Crazy Rich Asians is an absolute joy to behold, a truly outstanding romantic comedy. The film has been getting a lot of attention for its Asian cast and setting. That's groundbreaking and applaudable, but not the reason to see this film. Run to see Crazy Rich Asians because it's a great film. You will laugh hysterically, possibly shed a few tears, and leave the theater with a whole lot of love in your heart. Director Jon M. Chu (G.I. Joe: Retaliation, Now You See Me 2) has adapted Kevin Kwan's bestselling novel with flair and finesse. 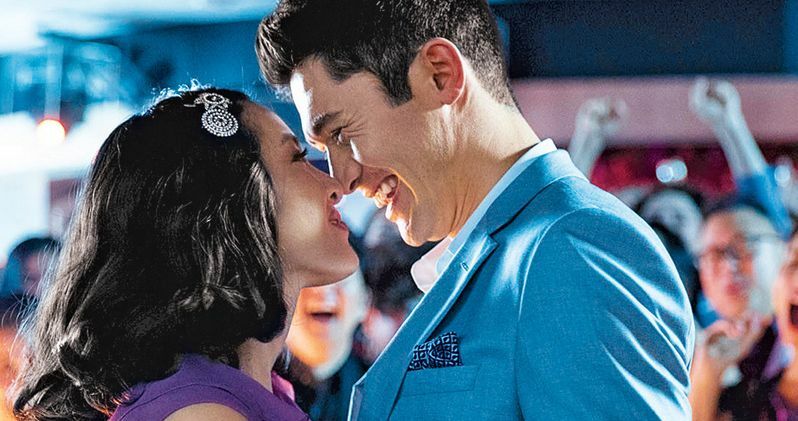 Crazy Rich Asians is easily the best date movie of the year so far. Constance Wu stars as Rachel Chu, an economics professor at NYU. She's been dating the dashing Nick Young (Henry Golding) for over a year. Nick is head over heels in love with Rachel. He asks her to accompany him to Singapore for his best friend's (Chris Pang) wedding. Rachel is surprised by the invitation. Nick had been quite secretive about his upbringing and family. The trip takes their relationship to the next level, so she happily obliges. Little does the couple know that social media spies have already heralded the return of the prodigal son, and his mysterious girlfriend. The cat is let out of the bag during their first class flight. Nick is near royalty, of sorts. His family are billionaires, construction magnates that developed Singapore from China. Not only are the Youngs super rich, they are the crème de la crème of high society, the absolute pinnacle of an extremely discerning social order. Rachel is utterly stupefied by their wealth and ostentatious lifestyle. She finds herself out of place, at odds, and viewed as a dire threat by Nick's supercilious mother (Michelle Yeoh). Can the down to earth, spunky New York City girl survive the moneyed cutthroats of Singapore? Love may not be able to conquer all against such daunting odds. Crazy Rich Asians has a dynamic plot that's successful across the board. Rachel is not Cinderella. She isn't an oppressed girl, mired in poverty; waiting for a rich suitor to sweep her away. Hardly, Rachel is beautiful, intelligent, and affluent in her own right. It's her background, class structure, and jealousy that makes her despicable to Nick's family. The caste system prejudice, coupled with the rigid familial dogma of Chinese culture, is a near impenetrable barrier for an outsider to breach. The same issue happens, in reverse, for Nick's stunningly beautiful cousin, Astrid (Gemma Chan). Her husband (Pierre Png) is a former army officer who's constantly emasculated by her wealth and status. Crazy Rich Asians paints an insightful picture of the barriers these couples face to happiness. It's both funny and heartbreaking to see. Constance Wu is superb as Rachel, but the ensemble cast deserves every accolade as well. They are so damn funny, and at points, wickedly vindictive. Crazy Rich Asians is loaded with offbeat characters. You'll get to know every single one of them. They each have an important part to play in how the story develops. The screenplay by Adele Lim and Peter Chiarelli is deftly written. Rachel and Nick's romance is always the center of attention, but they wisely allocate key character roles to reinforce their story's premise. One couple, another of Nick's cousins, has few speaking lines, but what they say, and how they're seen; speaks volumes to the crux of the narrative. Crazy Rich Asians draws you in with the details. The characters, the setting, and the plot are brilliantly realized. Lim and Chiarelli's script is Oscar worthy. That's significant praise for a romantic comedy. Crazy Rich Asians has gleaned enormous press coverage. It is the first all-Asian Hollywood production since The Joy Luck Club in 1993. That's twenty-five years ago and an appalling statistic. Beyond being half the world's population, it boggles the mind that the Asian audience is so ignored in America. Crazy Rich Asians shouldn't be an outlier, or have to bear the brunt of mammoth expectations. Unfortunately it does on both counts. The good news is that all expectations are obliterated. Crazy Rich Asians sets a high bar in the romantic comedy genre. Warner Bros. has a box office hit. Will Crazy Rich Asians Take the Summer Box Office Out on a High Note?